Joining the scurrying Bank Holiday weekend throng on Waverly Bridge outside the station, a line of large, Victorian/turn of the century buildings met our gaze, as if in a standoff. This deceptively stoic first impression was quickly replaced by promises of entertainment galore, even on an overcast Sunday, as we passed under North Bridge, and poster plastered Market and Jeffrey Streets towards Cowgate, where we'd spend our first night of four as the city’s famous Fringe Festival was drawing to a close. Looking up, the famous Castle impressed. So little time and so much to see and do in Edinburgh! Checking maps and last minute festival tips, we took a stroll down Cowgate that evening and found ourselves in front of The Three Sisters, ‘Free’ Sisters during the festival. 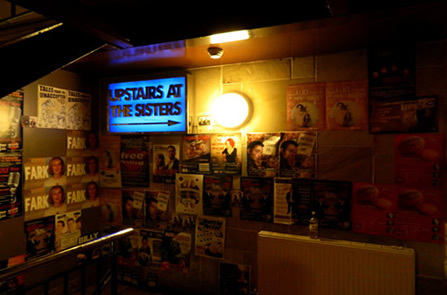 A doorway next to what seemed a former brewery turned large pub lead up a narrow flight of stairs past Maggie’s Front Room, where a comedian could be seen onstage through a glass window on the door, to cramped, windowless, low ceilinged white-washed Maggie’s Chamber where two comediennes, both of whom seemed confident, quick witted and personable, entertained the audience in turns. The one who was on when we walked in, our suited, wiry blond hostess, said she was married to a poet, and joked about bagging a £5,000 a year man. The second, whose name I couldn’t catch from the back of the crowded room, shared anecdotes about her former mother in law, who’d apparently, spread rumours that a nose job might help her career. After these two talented ladies left the stage, we were asked to clear the room so London based New York comedian Lewis Schaffer,whose voice we know from his Resonance FM (104.4 FM – London’s only independent radio station) Americans in Nunhead show, could rearrange the folding chairs. Joining the queue snaking its way down the corridor outside the door, we saw Schaffer himself, working his way along, shaking hands, joking, intermittently running his hands through his dark hair. ‘We’re not from Nunhead,’ my husband called out, adding, ‘She’s from Philadelphia, ‘meaning me, as Schaffer approached us. We shook hands, and as he walked off I added, ‘I came all the way from Philly to see you.’ The comedian quickly came back with, ‘I came all the way from New York to see you; we should compromise and meet in the middle.’ And meet in the middle we did, for during his set, I was repeatedly called on to back up his comments that he, being from NYC, was from ‘the greatest city in the world in the greatest country in the world.’ Possible yes to the first, abiding doubts about the second... Though Schaffer’s remark that Philly is to New York what Croydon is to London should have been met (by me) with, ‘yeah, but Philly hasn’t had any riots lately.’ That said, Schaffer has a knack for working with whatever the audience throws at him, seemingly, turning it in on himself before tossing it back at them. That includes our penchant for racist humour as long as it’s not about our own race, i.e. Jew, Pole and other such jibes. Be that as it may, as we left the complex, an English Indian woman ( with a London accent) was heard answering a Scottish security guard’s question of who she’d seen, with ‘Lewis Schaffer, he’s really good,’ to which he replied in thick brogue, ‘yeah I know, I’ve seen him four or five times.’ For the most part, Schaffer has his fans – even the ‘Jew’ in the front row with the ‘trophy wife’ who got a big laugh when he told him he’d seen him ‘struggling’ last year was back for more. 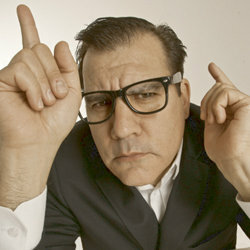 In terms of entertainment, I’d say this episode of Schaffer’s ‘Free until Famous’ show, Now YOU Shut Up, was as he himself commented, ‘great value for money.’ Catch him at the Source Below in Soho, London for free. Though ambling round town was meant to aide our explorations of Edinburgh on the morrow, as things stand, I’m currently undergoing treatments for a foot problem and my dogs was barkin’ as they say, so we cooled our heels round midnight Sunday, in hope of being fresh and raring to go in the AM. After scanning festival magazines and handouts Monday morning, closing day, we headed towards the Assembly compound in George Square, where we would see our first and only music show – Hohhot, Inner Mongolia’s AnDa Union, whom we’d read about in a Songlines magazine at WOMAD Charlton Park and listened to online thereafter with great enthusiasm. The AnDa portion of the group’s name aptly means ‘blood-brother’, and as their manager Tim Pearce has said, ‘what makes AnDa Union so special is that they bring the intimate atmosphere of the ger onto the concert stage.’ Strolling along in Edinburgh, especially during Festival time, one quickly learns to look forward to the unexpected, and at George Square, we came upon a merry band of kilted boy-band type singers doing their thing in by then driving rain to the enjoyment of those watching, mostly teen-aged girls. After fortifying ourselves with some steaming soup, the rain subsided and we joined the excited queue at Elegance, a speigeltent with the faces of 1920’s flappers and Gatsby-esque characters painted over its entrance. We were met there by members of AnDa Union themselves, and each concert goer received a gracious blessing with a sky blue Buddhist scarf, draped round their neck by one of the musicians. This set the tone for what was a glorious set, played and sung by the group with imagination, grace, wit and good will, which thrilled and delighted by turns. Any strangeness experienced at initial sounds of horse hair fiddles, uncustomarily played drums, reed pipes or other formerly unknown instruments and/or traditional Mongolian throat singing quickly evaporated as their evocative, personable performance continued, shedding light on their nomadic, grassland culture at the same time as it heightened the rapt atmosphere in the venue. As the name of the show, The Wind Horse suggested, songs played were taken from their great debut CD. At the conclusion of their rousing set, the group humbly took their bows and we thanked them as best we could via cheers and applause for what had been an enlightening and far too swiftly passing hour. Having moved from bog-standard Cowgate to surprisingly modern, designed with comfort and a dash of style in mind, Queen Street Travelodge, where we would spend the next two nights, we made our way to Underbelly, with its famous oversized upside down purple cow, and, after perusing that area and The Gilded Balloon adjacent, explored the Pleasance sector nearby, with signposts pointing every which way, including NYC, all the while making mental notes for next year. The largest of the three areas, Underbelly, was made especially welcoming by the presence of heat lamps beneath their huge umbrellas, in turn, under a ‘roof’ of clear plastic to protect us from the ever changing elements above. So it being a rainy night, we took advantage of the ambience of the place while we waited for the queue to form in Bristo Square as we geared up for the now well known One Man Star Wars Trilogy, written and performed by Canadian actor, Charlie Ross, directed by friend and fellow enthusiast T. J. Dawes. It was a show we’d been meaning to see for years, and being a huge fan of the original (and still best) Star Wars trilogy, we were definitely up for it. From his specially rewritten pre-show text, through his singing of John Williams’ score, blipping and tweeting as R2D2, upper crust fussing as C3PO, mystifyingly misleading Yoda, winging Luke, light sabre happy Ben, heavy breathing Darth Vadar, wide bodied Jaba and caution to the wind Han and his werewolf type sidekick, Chewbacca, and, ‘only woman in the story’, Princess Leia, with quick witted, seemingly adlibbed quips coming fast and thick from the observation deck like fast moving curve balls, with nary a plot line out of whack, we’re never left out of the picture Ross so joyously frames for us. As such, it’s a sure bet to say that never before has one man made so many sound effects, utilizing every square inch of stage in so many different guises, each a hilarious caricature, in such a short space in time. By the time Ross took a break at the end of his warp speed trilogy to offer interesting background information on the reaction of George Lucas and company to his show after he’d been performing it for a spell, having been along for the wildly effective but intentionally bumpy ride, a la Han Solo’s ‘old rust bucket’ these filmic adventures kicked off in, his audience seemed nearly as Star Wars worn as he was. Ross’s manic, but well thought out, on his feet performance also gave a sense of a full on artist coming to the close of a manic series of Edinburgh Fringe Fest shows. Believe it or not, this colossal memory feat of a show was being performed in rep with Ross’s sure to be equally comic/epic One Man Lord of the Rings! 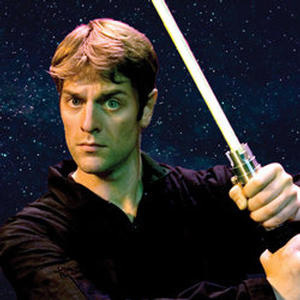 Charlie Ross is One Man Star Wars Trilogy! Tuesday saw us taking in culture on a different sphere at Scottish National Gallery where we visited Van Gogh to Kandinsky – The Symbolist Landscape in Europe 1880 – 1910, an exhibition I was eager to see, as much for its appreciation of the emotional power of colour and mythic elements as for its works of note. 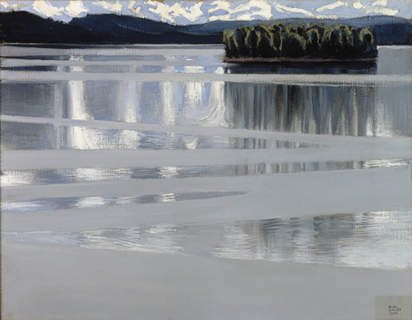 And, as the Gallery proudly proclaimed, there has never been a major exhibition based around Symbolism in landscape painting before. In addition to featuring work by a wide range of European artists, each room also boasts a listening post with either striking contemporary classical music like Rachmaninoff’s, which influenced the work of one of the artists on show, or a portion of a letter read aloud by an actor, reinforcing such connections in the minds of viewers, i.e. 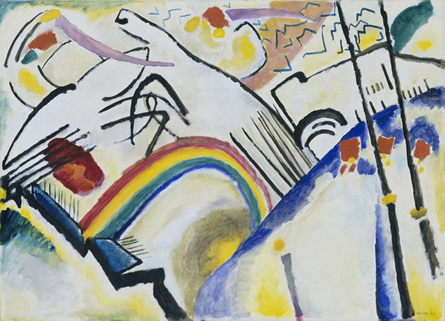 Kandinsky’s appreciation of Wagner. The exhibition has been thoughtfully arranged to highlight such juxtapositions, with section headings pertaining to various aspects of landscape and works by similarly inclined painters in close proximity to enable comparisons. Potential crowding round/difficulty reading captions has also been taken into account, as folders containing the info in enlarged text can be found on the wooden seating in each and every room. For me, as for many others I’m sure, any exhibition with a Van Gogh painting of note is well worth visiting, in order to see how it relates to the overall subject matter. In my case, that’s possibly as the first painting I ever developed a relationship with in my youth was Van Gogh’s Rain, part of the permanent collection of the Philadelphia Museum of Art (yes, the one in Rocky films) which I’ve often revisited since there. 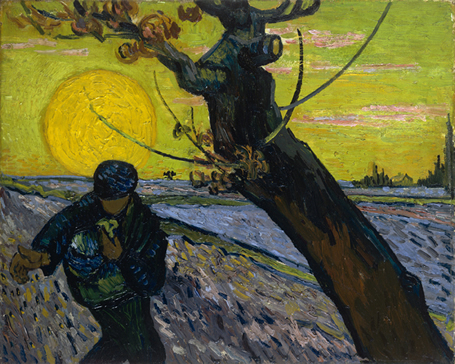 Here, most outstanding of two on show is Van Gogh’s perpetually glowing autumnal painting, The Sower (1888), loaned by Van Gogh Museum in Amsterdam. New developments, particularly in the field of science, and ways in which artists’ perceptions of the ever changing world around them changed in accordance with them is also explored through the themes and artworks displayed. The Gallery itself, where this contemplative exhibition is housed, is neo-classical in style, with stately Greek inspired columns flanking its entrance, and it is just one of a cluster of top notch galleries in the Scottish National Galleries group with notable works on display, among them, the Scottish Gallery of Modern Art, where the exhibition, Picasso and Modern British Art, formerly at Tate Britain, is now on display, as well as a collection of drawings by Munch. The other gallery comprising this impressive trio is the Scottish National Portrait Gallery. All are centrally located, with a free hourly bus aiding travel between them. Visits to all are highly recommended. 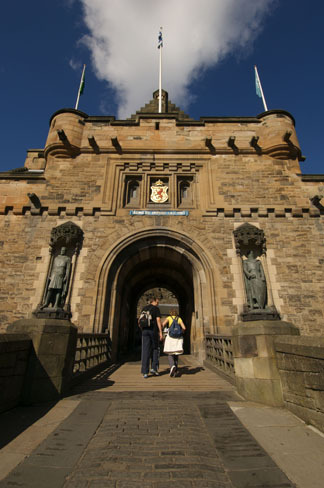 For me, and I’m sure many other visitors, the most iconic thing about Edinburgh is that it sits below a huge, craggy Castle, the summit of which is 130 meters (430 feet) above sea level, atop volcanic Castle Rock, the tail of which trails off into the famous wool shop lined Royal Mile. As such, no visit to this noble city would be complete without a trip to that esteemed place, Scotland’s most visited paid tourist attraction, so onward we went, though we’d been forewarned of afternoon downpours. The curving walk up to the castle via Prince’s Street Garden is a surprisingly easy one, despite the fact that these regal buildings seem so high up, as the path by that route is sloped, making your ascent a gradual one. Not only that, but the way is made even more scenic by these parklands and gardens beneath the castle which add considerably to its’ vistas. Despite warnings of impending inclement weather, we headed into the National War Museum of Scotland shortly after our arrival on the castle grounds. It is a place rich in artifacts and stories of 400 years of the country’s military history and the struggles of its people, beginning with the 17th century, which have a great bearing on the national identity of today. The last segment on display, which we saw on the very night of the opening of the Paralympic Games, was about prosthetics, as they relate to injured soldiers and I left the museum with a renewed respect for them, and the athletes I was soon to cheer on. Time flew while we were there, and as we were about to leave the museum, a thunderstorm of Tempest proportions was already in progress so we, of great faith, with one flimsy brollie between us, waited at the door among a similarly optimistic throng before continuing on our way, at which time, we made a dash for the what turned out to be a whiskey shop. Resisting temptation, we headed out amid a slackened but steady drizzle and took in the spectacular panoramic view of the city from our side of the castle. In more amiable conditions, I might have attempted to weave my way up the ramped ramparts, to David’s Tower, but when the winds picked up where the rain left off, we made our way instead to the Castle’s Royal Palace apartments. These large chambers are grand in a sturdy way, rather than a grandiose one, and though they have limited furnishings, their huge fireplaces and reconstructed decorating give a good impression of what it might have been like to inhabit these oversized rooms in their day. They were surprisingly cosy for their locale, and I don’t think that was just because of the downpours outside. Slipping out of one doorway and into another, we found ourselves before the near mythic Honours of Scotland: the Crown, the Scepter and the Sword of State, oldest set of crown jewels in the British Isles. 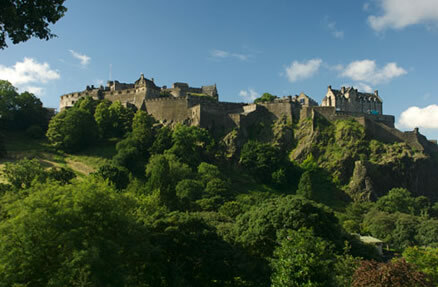 Last employed for Charles II’s coronation in 1651, the Honours were originally hidden to protect them from Oliver Cromwell’s destructive intent, and moved from place to place before they were smuggled back to Edinburgh Castle and nearly forgotten until 1818, when poet Sir Walter Scott and his men rediscovered them there. 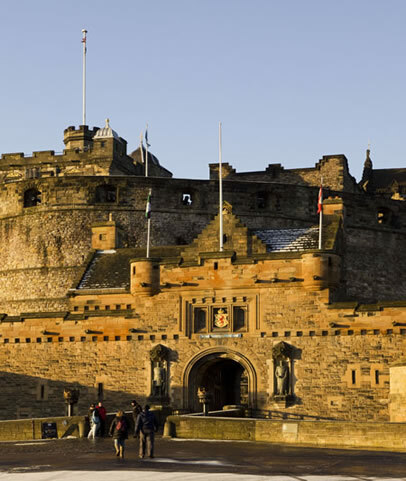 They have been on public display in the Castle since 1819, lone exception being its shielding from possible German invasion 1941- 53, after which the Honours were restored to their true home. They are so much a part of Scotland’s history that they are depicted on the crest of its Royal Coat of Arms. Small, but somehow, cavernous, early 12th century St. Margaret’s Chapel, oldest surviving building in Edinburgh with its hushed mood and medieval arch, and grand, high ceilinged 16th century Great Hall were other highlights of our visit. The Scottish War Memorial, with its stained glass windows and other tributes to those fallen in battles, where we paused to absorb history and atmosphere, inspired thoughts of all the wars inherent to men down through the ages, Scottish and otherwise. The sight of wrapped and wired fireworks lining the parapets as we made our way downwards in the pouring rain as we left made us wish we were staying through Sunday, when they would be fired off to mark the end of this year’s Edinburgh Fringe Festival. 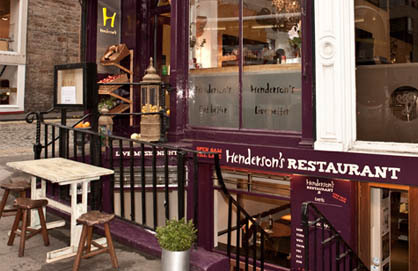 I’m a recent convert, but to my mind, no visit to Edinburgh would be a well rounded one, (pun intended) without a stop at the original Henderson’s Cafe on Hanover Street, now in its 50th year, where all manner of delectable vegetarian delights await you. Having already swum, as it were, in the hearty rainfalls of Edinburgh I was delighted to immerse myself in THE most delicious bowl of red lentil, tomato and red pepper soup imaginable, accompanied by homemade oatcakes, which I could happily munch on forever, providing they were as authentically Scottish as those. A well stacked slice of Focaccia pizza, topped with a myriad of grilled veggies and melted Scottish cheddar, landed me in foodie, albeit, diet conscious heaven. If I hadn’t coached myself, I might have also gone for one of their enticing full berried deserts and as my partner would tell you, I’ve been steering clear of sweets for months, organic included. Nothing eaten anywhere on this trip beat Henderson’s food for flavour or freshness. You might say it was the rain and my soaked clothes that made this seemingly humble meal so satisfying. Au contraire...On my word as an avid cook and devotee of well prepared food, eat at Henderson’s, you won’t be disappointed. Henderson’s also has an equally popular Bistro on Thistle Street for those seeking table service, an organic bakery, a gallery where local artists are invited to exhibit their work, and Henderson's Cafe at St. John's Church on Princes St. If I visit Edinburgh again, what would I do differently I hear you ask. Well, as I love the city itself with its distinctive, well warranted sense of pride and heritage, helpful locals, multi-tiered winding byways, host of cultural and entertainment options (festival or not), multitude of green spaces, (most in a European city) overseeing castle, close proximity to beautiful Pentland Hills, and North sea (less than an hour away by bus), I’m sure I’ll be heading back that way again in the not too distant future to take in more of what it has to offer. Whenever I do, whatever the weather, I’m sure I’m sure to be spoiled for choice.